Here are 4 new tools to help you write job descriptions that attract a more diverse team. 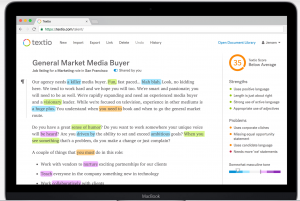 Ongig’s Text Analyzer software eliminates bias and improves ad copy. 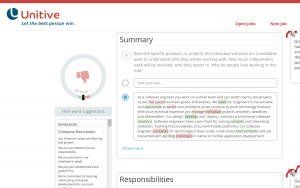 We created Text Analyzer after rewriting thousands of job descriptions for some of the largest brands in the world. Ongig’s software has also been improving branding and engagement (video, pictures, maps, chat, etc.) for job descriptions since 2011. 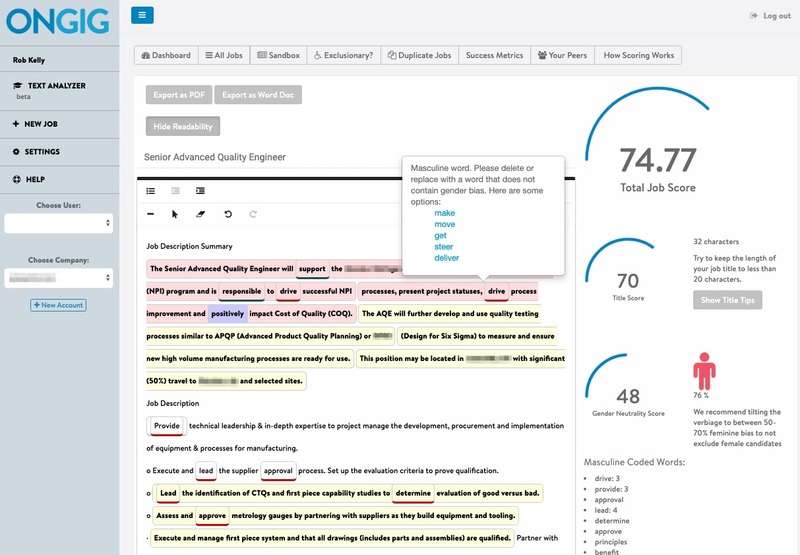 Text Analyzer has a super-easy interface that highlights gender bias, race bias, age bias, ageism/disability bias, title effectiveness and readability. First, you get a dashboard of Total Score and Gender Bias Scores which is filterable by team, location, recruiter and hiring manager. You even see how you compare to your top competitors. Then you dive into each job description with easy recommendations on how to easily improve your scores. Text Analyzer lets you eliminate bias and have the most effective text ad copy in the world. Another alternative is Textio. It’s an online writing platform made by job posting outcomes from recent job openings. These outcomes allow Textio to analyze your job description and provide a score of how it stacks up in terms of diversity, neutrality, and overall success. Feedback is given in the way of color-coded words with suggestions for improvement. 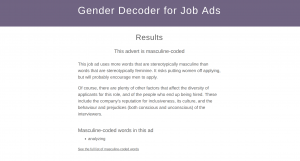 Gender Decoder is a simple (and free) job description tool alternative. It was created by Kat Matfield based on a study that looked at the psychology of how different words attracted males and females to certain jobs. The tool compares your text to feminine and masculine word listings created from the study. For small businesses, Gender Decoder is a good free alternative to Ongig and Textio for flagging gender-biased words. A final alternative is Talvista (formerly Unitive and then Talent Sonar). It’s an online platform created to streamline the hiring process for hiring managers and recruiters. I found its interface — with a step-by-step progression — very user-friendly. In particular, the integrated job description builder lets you type new or paste existing job description content into predetermined sections. It reviews text for word choice, positive or negative language, and feminine or masculine words, giving alternative options to the user. Ongig is on a mission to help you create the most attractive, engaging and effective job descriptions in your industry (if not the world!). Ongig’s Text Analyzer software transforms job descriptions to free you up your recruiters and hiring managers. And if you don’t want to rewrite your job descriptions yourself, one alternative for you is to have Ongig’s pro copywriting team rewrite job descriptions for you. Click here for a demo if you are interested. Ongig is the video job description platform that helps you attract the best talent faster. Ongig supercharges your job descriptions through video, images, and other media along with live chat, social sharing, and careers microsite creation. Early clients of Ongig include Yelp, GoDaddy, Verizon Digital and Autodesk.